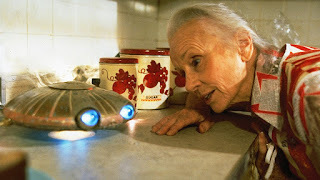 A Steven Spielberg produced family friendly science fiction drama, Batteries Not Included features cutesy aliens and cool special effects, as well as bloated emotions, superficial characters and a flimsy plot. In a derelict corner of East Village, Manhattan, an entire neighbourhood of old buildings has been purchased and razed to the ground as ruthless developer Lacey plans to build a clutch of new highrises. One old building still stands in the way, and Lacey has hired local thug Carlos (Michael Carmine) and his gang to pay off or scare away the few remaining tenants. 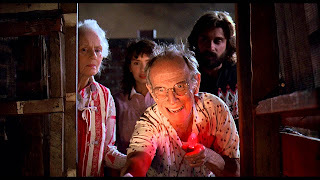 The holdouts include elderly couple Frank and Faye Riley (Hume Cronyn and Jessica Tandy), struggling artist Mason (Dennis Boutsikaris), pregnant woman Marisa (Elizabeth Peña) and handyman Harry (Frank McRae). With Carlos becoming more violent in his methods to forcibly evict the tenants, Frank fervently hopes for some kind of intervention and two miniature friendly spaceships arrive to help. The mechanical aliens have the ability to repair anything, fight off aggressors and even reproduce. The residents are empowered by their new allies to stand their ground, forcing Carlos and Lacey to pursue even more desperate measures. A mash-up of Cocoon, E.T. and a scaled down version of the alien spaceship from Close Encounters Of The Third Kind, Batteries Not Included is too intent on pushing facile emotional buttons to register with anyone over 12. Directed by Matthew Robbins and closely following the Spielberg whimsical playbook but lacking any genuine depth, the film generally gags on its own sugar level. The characters fighting eviction are a contrived multi-ethnic collection of lovables whose only purpose is to play stoic victims. Frank runs an old-style cafe located in the building, while his dotty wife Faye is exhibiting signs of dementia and always calling out for her absent son Bob. Mason's girlfriend has just walked out on him, Marisa is hoping against hope that her musician boyfriend and father of her child will return to her. Of course Mason and Marisa, both abandoned, start a relationship. Harry is a former boxer, recluse and television addict. He rarely speaks and when he does all his sentences are television advertising slogans. All that is relevant about the characters is revealed in the first 15 minutes, and they are then frozen in time as the cute machines dominate the rest of the film. The robots are adorable and the special effects are good for the era, but the film feels more like a manipulative advertisement for toys than a serious attempt at family-oriented drama. The bad guys are all bad, and the script fails to ever explain why a developer with the deep pockets and resources of Lacey would ever resort to blatant goonery to evict a building. Veteran couple Hume Cronyn and Jessica Tandy deliver reliable performances, but they are way above the material. The batteries may not be included, but the film nevertheless oozes icky acid.